Got big toe joint arthritis? We have Cartiva. Arthritis of the big toe joint is one of the most common foot problems affecting millions of Americans. There have been multiple methods to treat this common condition, from removing arthritic bone spurs to joint replacement to joint fusions. The latest procedure to treat this condition is the insertion of a synthetic cartilage like implant known as Cartiva. At Chicago DPM, I am thrilled to have this revolutionary treatment to help get people back on their feet and end pain. This FDA approved surgery involves placing a small jelly-bean sized implant between the joint to act as a shock absorber and as pseudo cartilage. NBC’s Lester Holt recently reported how this treatment can be a ‘Game-Changer.’ For those with excruciating arthritis that even have difficulty in most shoes, it offers hope. Previous treatment required the big toes to be fused together with screws and plates, but that limits movement. 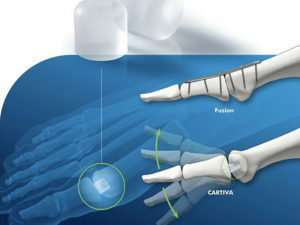 Cartiva is simply an insertion of a synthetic cartilage offering comfort, flexibility and function.